During an afternoon rehearsal in early January, the music on the stands of the members of fivebyfive is David Lang's "Sweet Air." The ensemble is rehearsing the piece for an upcoming concert, and as it happens, that title is an ideal, two-word description of this contemporary classical chamber ensemble's sound. Since its formation in 2015, Rochester's fivebyfive has sounded and acted like a "downtown," New York City-based new music ensemble – not only through its repertoire, but also as the catalyst for many exciting artistic collaborations with everyone from dancers and school kids to video artists and a vintage clothing store. A fivebyfive performance has the collaborative spirit of chamber music and the welcoming sound of camaraderie. And you can, occasionally, dance to it. Fivebyfive is, of course, a quintet: Laura Lentz on flute; Marcy D. Bacon, clarinet; Sungmin Shin on electric guitar; Haeyeun Jeun, piano; and Eric J. Polenik on double bass. If any of their names sound familiar, it's because each fivebyfive member has a busy career of teaching and freelance performing with local musical organizations. After eight years of performing in Italy, Lentz now teaches at Rochester Institute of Technology and at her private studio. 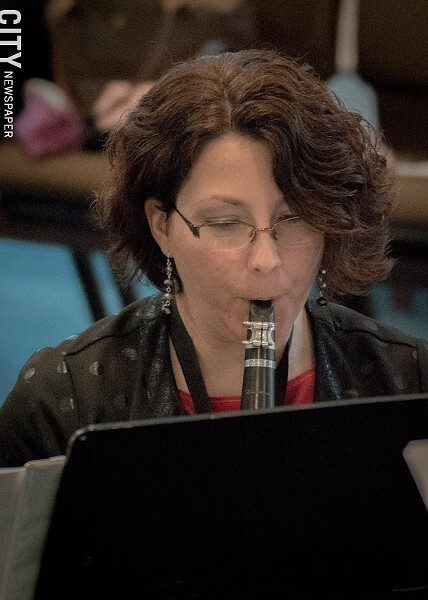 Bacon teaches at Nazareth College and Hochstein School of Music, and performs in the Wilmot and Fem Vindar wind quintets. 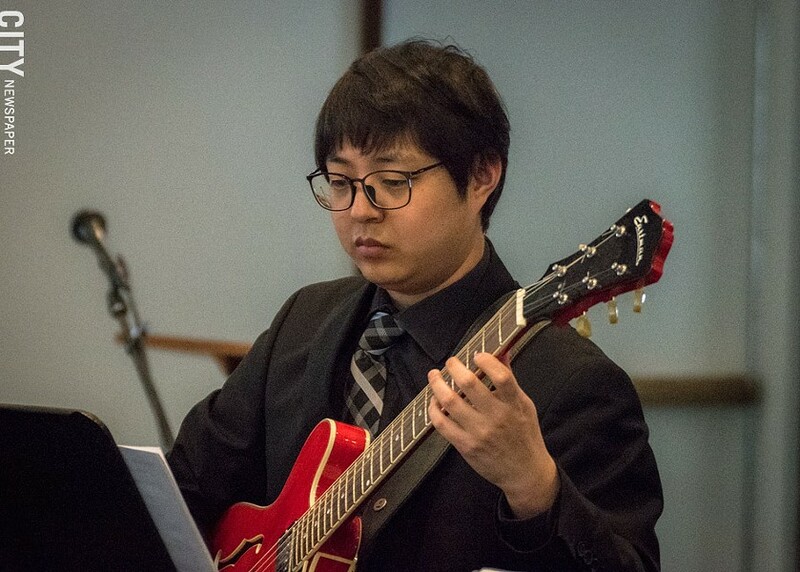 Shin, a member of the Tantalus Guitar Quartet, teaches classical and electric guitar at Eastman Community Music School, Music & Arts in Pittsford, SUNY Buffalo, and at his home studio. 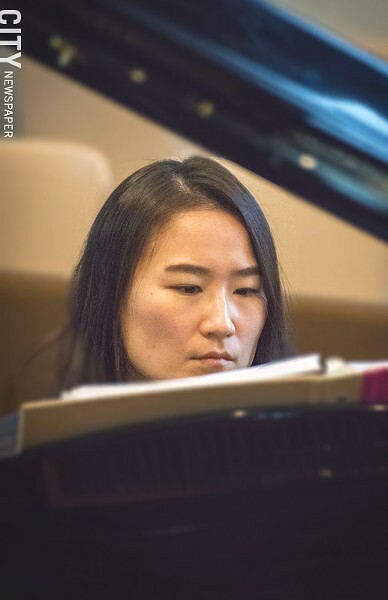 Jeun, who won a silver medal at the 2013 Seattle International Piano Competition, teaches at Finger Lakes Community College and is organist and accompanist at Greece United Methodist Church. 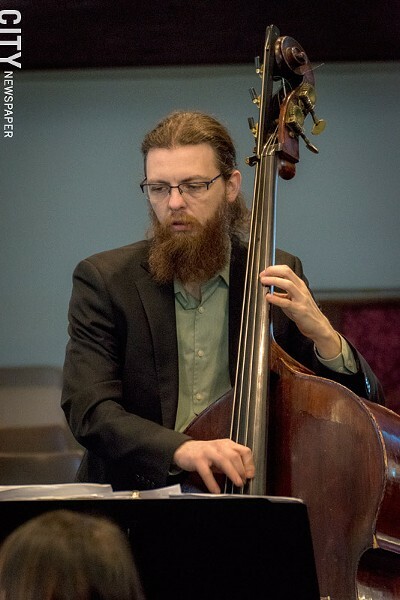 Once a member of the contemporary chamber group Gibbs and Main, Polenik has been a member of the Rochester Philharmonic Orchestra since 2005 and is a regular musician with Rochester Oratorio Society. 2018 was a breakthrough year for fivebyfive, with outstanding collaborative performances at the Rochester Fringe Festival, Visual Studies Workshop, and local high schools. The group was also heard on WXXI-FM's "Backstage Pass" in November, with a return visit to the radio station's noontime concert series "Live from Hochstein" scheduled for Wednesday, May 15. Fivebyfive has a couple of exciting collaborations with the Memorial Art Gallery in the works, including a performance on Thursday, February 21 with banjo player Ben Proctor of local Americana band The Crooked North, as part of the gallery's DeTOUR series. The concert will give a taste of fivebyfive, playing some favorite pieces from its repertoire, in an "immersive arts experience" matched to specific artworks at the MAG. And there are several more exciting concerts in store this year, one of which will feature the local premiere of a major contemporary piece, "Rounder Songs." 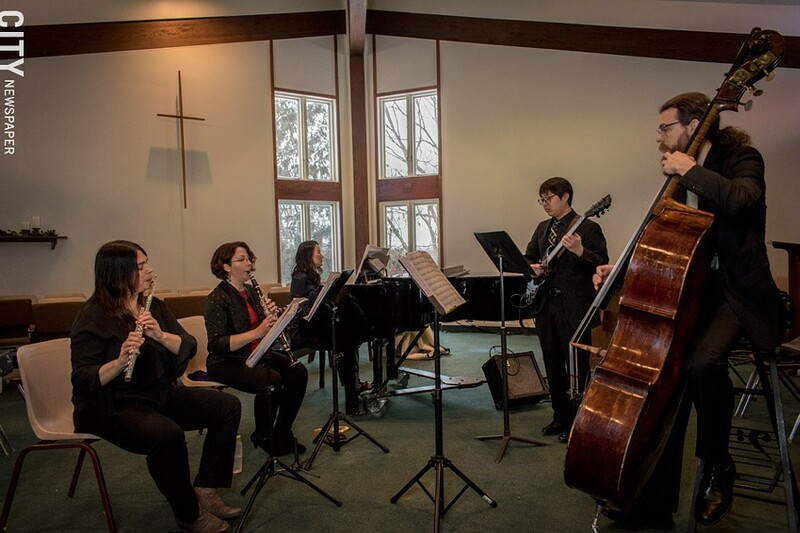 Fivebyfive is a Rochester success story, but also an example of a recently-formed classical ensemble that can get noticed despite the challenge of connecting with highly fragmented audiences. The group's success is due not only to its musical excellence – there are lots of excellent local musicians – but also its imagination and ability to adapt to a highly competitive musical scene. Unless you are one of very few musicians who can perform in a top-ranked orchestra or opera company, or one of very, very few who can have a thriving solo career, you'll need to diversify, to bring your art to segments of the public who have little familiarity with classical music. If musicians want a performing career after they leave the conservatory, they have to hit the ground running, with a willingness to leave the safety of the concert hall for different audiences in different spaces. The inspiration for fivebyfive came from two major contemporary music ensembles. In 2015, Laura Lentz heard the band Victoire, led by Missy Mazzoli, a composer best known for her chamber opera "Song from the Uproar." 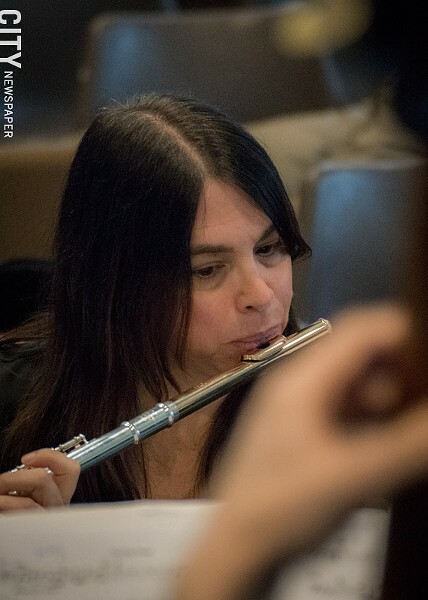 Lentz was inspired to start an ensemble of her own, drawing from the instrumentation and aesthetics of another well-regarded group, the NOW Ensemble. According to Sungmin Shin, fivebyfive started out by "adopting NOW's entire instrumental repertoire," with the same instrumentation of flute, clarinet, electric guitar, string bass, and piano. This was a solid start, since NOW's repertoire included works by contemporary classical music heroes like Meredith Monk and Philip Glass, among others. At the beginning, fivebyfive borrowed music written for NOW Ensemble, by such young, rising composers as Mazzoli, Judd Greenstein, Patrick Burke, and Andrea Mazzariello, along with iconic figures such as Pauline Oliveros and Astor Piazzolla. Many of these pieces were arranged by Eric J. Polenik, who is also a composer. "'No one's told us 'No, you can't,'" Polenik says, but he adds that some composers are very hands-on with their music and want to see and hear the results. Fivebyfive's sound is unusual, but also appealing and surprisingly versatile. It's airy but not weightless, solid but not heavy. In a piece like Missy Mazzoli's "Magic from Household Objects," the interplay of flute and clarinet creates a top layer of aerated sound. Somewhat unusually for a new music ensemble, there is no percussion. The bass and piano give the music solid harmonic and rhythmic underpinnings, as does the electric guitar, which in Shin's words, occasionally "changes the color scheme" through the use of different pedals. The ensemble's music can be enigmatic and elusive, with a hypnotic edge due to its connections to so many different musical styles: not just classical music but also indie rock, pop, minimalism, and jazz. That eclecticism appeals to fivebyfive's musicians. "The music speaks to us," Polenik says, "and because of that, it resonates with our audiences. It's music that meets people half-way. They don't have to study it to enjoy it. These composers often use techniques and harmonies picked up from pop music. It's a language we hear every day and that we understand." Fivebyfive is now adding its own contributions to the repertoire. One of the ensemble's current projects is a call for new scores. The selected composers will be announced this April. The ensemble reaches out to local composers as well: Marc Webster, an Eastman School of Music alumnus and owner of Blue on Blue Recording Studio in Rochester, wrote a playful, semi-improvisatory piece called "Hacky Sack" for fivebyfive; Glenn McClure, a SUNY Geneseo professor, is writing a piece tentatively called "What Lies Beneath," – inspired by Hawaiian volcanoes – for the group's Hochstein Performance Hall concert in May. A fivebyfive specialty is what the members refer to as "cross-pollination": fruitful artistic collaboration with other artistic groups, and even a few local businesses, in which the music is one aspect of the whole performance – which sometimes takes place in unexpected spaces. One of the ensemble's most successful partnerships has been with local dance company Biodance. "Aria," a collaboration with Biodance performed at the Lyric Theatre, was one of the hits of the 2018 Rochester Fringe Festival. "Source of Light", performed at the Visual Studies Workshop in December, interpreted music by three prominent women composers. For a concert last April called "Nice Boots," named after a Jascha Narveson piece on the program, fivebyfive partnered with the vintage clothing store The Op Shop, which offered a pop-up shop during the intermission. Besides its upcoming concert this month at the Memorial Art Gallery, the group has begun work on an ambitious performance scheduled at the MAG for February 2020, inspired by the stained glass art of Judith Schaechter. One of Schaechter's pieces in the MAG collection, "The Battle of Carnival and Lent," fascinated Laura Lentz, who brought the other members to see it. This led to the idea of commissioning four pieces from composers all over the United States – Edie Hill, Jung Sun Kang, Andrea Mazzariello, and Jonathan Russell. The composers will visit Rochester during the fall of 2019 for open rehearsals at MAG, and the music will be premiered and professionally recorded, in February 2020, during an exhibition of Schaechter's work. Sunday, April 7 brings a fivebyfive concert entitled "Sweet Air," highlighted by the Rochester premiere of "Rounder Songs," a 2016 song cycle by Emily Pinkerton and NOW Ensemble member Patrick Burke. Written for voice, banjo, and chamber ensemble, "Rounder Songs" draws on songs and legends of Appalachian "rounders," rural drifters ranging from shifty to murderous. The haunting musical material sounds like the soundtrack of an imaginary Coen Brothers movie, combining old-time American folk music with contemporary post-minimalism. This is another wide-ranging collaboration, including media projections by W. Michelle Harris and refreshments from Sinful Sweets. And again, the venue is a bit unexpected: the Rochester Academy of Medicine. Performing in schools has been an integral part of fivebyfive's mission from the beginning. Starting in April 2016 at Canandaigua Academy, the group has performed at East High School, Edison Career and Technology High School, Twelve Corners Middle School, Allendale Columbia School, and elsewhere, for students ranging in age from kindergarteners to high school seniors. On March 14, they'll join School 19 students at the Church of Love Faith Center to take part in a program called "Strings for Success," performing music by Marc Webster. As fivebyfive's level of expertise with young musicians has grown, so have the educational opportunities. The group often invites students to perform with them. At a couple of schools, fivebyfive has given the students the challenge of improvising their own musical work. "We'll rehearse with them two or three times before the performance, coming up with cues of how to start and how to finish," Lentz says. "We want the kids to see that chamber music is also today's music. And we want them to feel ownership of the music, too. We have them onstage with us, and we ask for their ideas." The group sees these presentations as not just "educational concerts," but something more: a path to awakening musical creativity in young people. "If kids get the opportunity to play and to create their own music, that can have a very long-lasting effect," Lentz says. She recently ran into a student in a drugstore who had been a drummer in one of their school gigs: "He told me, 'Now I'm doing my own composing and scoring.'" So far, fivebyfive has had a brief but lively career in a challenging musical environment. And the ensemble has advice for groups that are just starting out. "Find people who respect and enjoy the music as much as you do," Marcy D. Bacon says. "Before we started fivebyfive, we knew of each other, but had never performed together. Our love of the music bonded us." "You have to be dedicated – it'll be a lot more work than you thought," Lentz says. "And when you make your first budget," she laughs, "quadruple it." In Sungmin Shin's words, "We're not quite what we originally expected to be. We've had many ups and downs, but we continue to evolve and grow." "Strategic planning is important," Polenik says. "We've confirmed a plan, with one new project each year. We'll continue to focus on audience-building and commissioning new music." "We're all dynamic personalities," Shin adds. "Rehearsals are not always easy, and sometimes we don't agree. But he says that fivebyfive's mission will always remain the same: exemplifying "the collective spirit and creativity of modern chamber music."